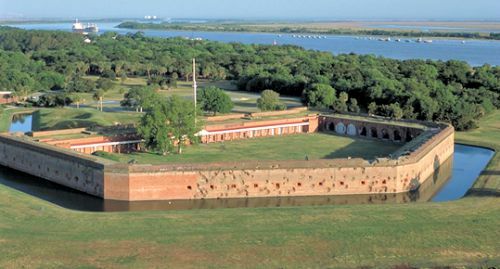 Fort Pulaski was the result of an order given by President James Madison after the war of 1812, to better protect the country from foreign invasion. Construction began in 1829 but was not completed until 1847 at a building cost of almost $1,000,000, which at the time was an immense amount of money. It boasted 11-feet thick walls, thought to be impenetrable to even the largest of cannon, and had around 25 million bricks. Named after a Polish military commander and veteran of the war of 1812, the fort was to play an important role in the civil war by protecting the strategically important port of Savannah. The confederates held the fort during the start of the civil war but the nearby island of Tybee was thought to be to small and difficult to defend, so it was abandoned by confederate troops. This allowed Union forces to gain a foot hold across the river from the fort and prepare an attack. On the morning of April 10th, 1862 the Union forces began bombardment of the fort after Colonel Charles H. Olmstead refused to surrender. They fired their new James Rifles cannons and Parrott rifles at the fort, which greatly outranged the cannons the fort had to defend itself with. 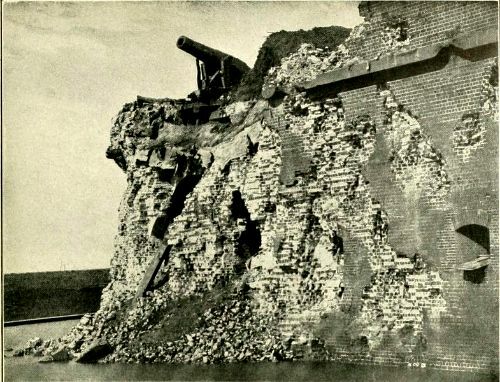 In less than 30 hours a corner of the fort was breached (pictured below) and the Confederate commander surrendered. After the civil war Union forces quickly rebuilt the fort, though it was never attacked again. Today it is open to the public as a tourist attraction and is listed as a national monument. As you may be able to guess the ghosts that reside at the fort are those of the soldiers who died here during the civil war, but it wasn't from the union attack of the fort. During the initial siege which caused the surrender of the fort there weren't actually any deaths, only one wounded soldier on each side. The hauntings are thought to be from when the fort was used as a prisoner of war camp which held hundreds of confederate soldiers. There is a story about when the attack on Charleston began, the confederates took 600 of their union prisoners and marched them directly into the line of artillery fire, which seemed like a good idea at the time since they didn't have enough food to feed them anyway. The Union forces retaliated by taking 600 of their prisoners and placing them on a beach during an attack from confederate artillery. This trait of mistreating prisoners of war seemed to continue strongly in fort Pulaski. The many stories of southern prisons starving union prisoners due to lack of food from the port blockades found its way to the north and retaliation was considered fair in this respect. The confederate prisoners stationed in the fort were placed on starvation diets and beatings and general mistreatment were common place. As you can probably guess this led to many deaths in the fort, mostly from starvation. As for paranormal activity here its mostly focused around apparitions and emotions. Guards of both union and confederate troops have been seen here, most often just standing still and staring out over the grounds, as if waiting for an attack. There are also many parts of the fort were some people have been overcome with a type of intense emotion, often fear or sadness, to the point where they have actually burst into tears or had to flee the area. There's even a story about when a movie called "Glory" was shot in Savannah. Apparently there were a number of actors on set all dressed in confederate uniform, when suddenly an officer appeared and ordered them to get into line. Going along with it to impress the visitors they did as he instructed, then when he ordered them to about face they all turned around, only to find no further commands. When they turned again the officer was gone and could not be found anywhere within the fort.